Pear Moscow Mule is THE fall ginger cocktail you need to be drinking right now. 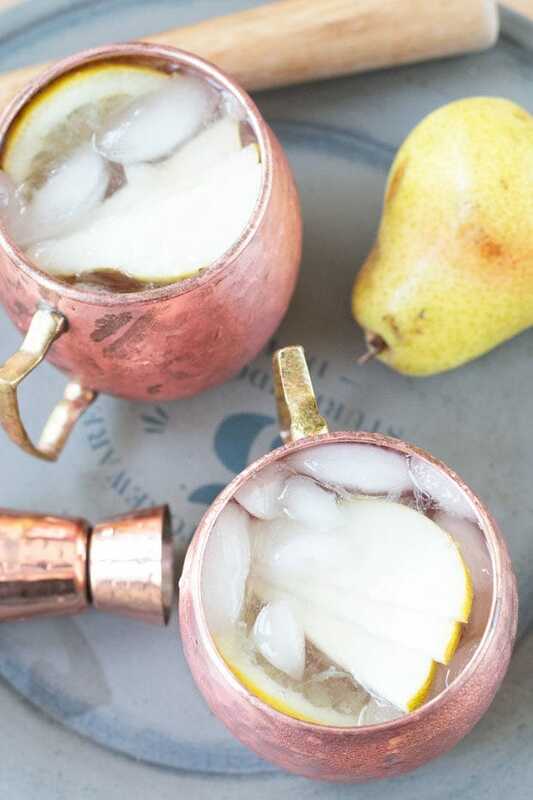 The pear and ginger combination is perfect for cozying up with as the weather starts to cool off. You know when you find a cocktail that you love and you get into a serious groove with it? 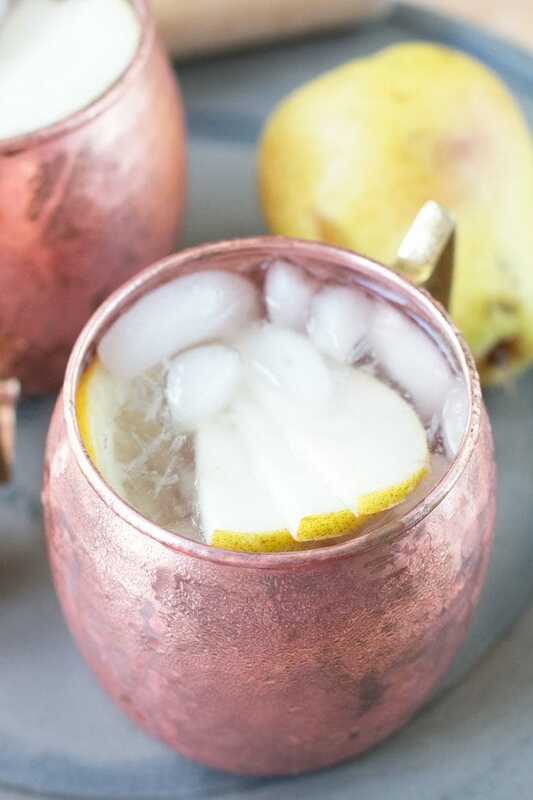 That’s exactly where I’m at with this pear moscow mule right about now. Starting my night off with a crisp gingery, bubbly cocktail is becoming a habit for me. Well, with my drinking habits I suppose it’s more of a craving since I am constantly getting distracted by other shiny boozy things. Plus I keep running through ginger beer at a pace that is a little bit ridiculous. I can’t help it though! The ginger, the bubbly bite, I don’t even need any booze in it to enjoy sipping on it. But let’s be real, it tends to be so much better with booze doesn’t it? Especially when it’s pear vodka. I can’t lie, this week is a wee bit intense for me so I’m kind of having trouble thinking of what to tell you right now. It’s like writer’s block, except there’s tons that I could tell you about – like the fact that I finished my fantasy draft or that it looks like I’m moving in the very near future – but I just can’t seem to tap into the creative juices. All of the stuff is right there at the surface, just waiting to be shared, and I am just staring at my computer screen like a halfwit. I think I could probably use another 10 hours of solid sleep to reset my mind. I’ll be back to better functionality tomorrow, I swear. 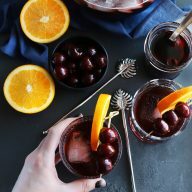 For now, just appreciate the deliciousness that is this cocktail and kick back with me while I delve further into Stranger Things on Netflix (OMG THIS SHOW IS SO GOOD). 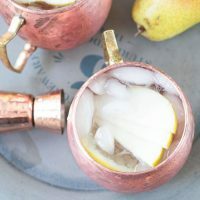 The combination of pear and ginger in this cocktail is perfect for fall! 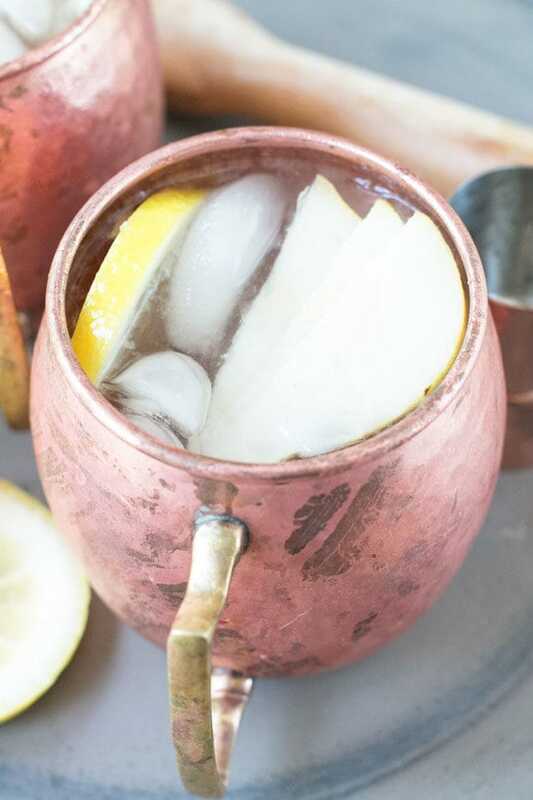 In a copper mug, muddle together pear vodka and lemon wheel. 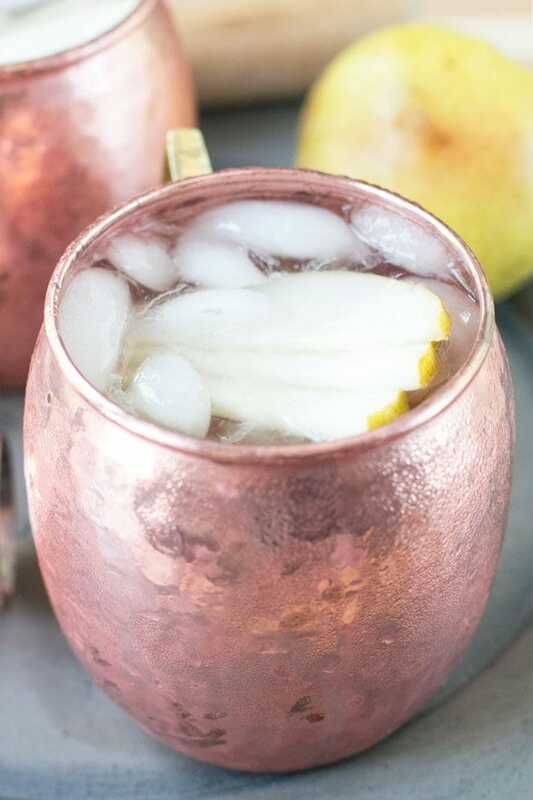 Fill the mug with ice and top with ginger beer. Give it a quick stir and garnish with a pear fan. Yum! 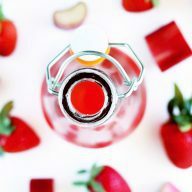 Love the inclusion of pear to fall-ify the drink. 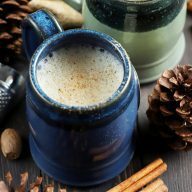 What kind of ginger beer do you use, and how much of it? I love to use either Oskar Blues Ginger Beer or Fever Tree. You will end up using about 5 to 6 ounces, depending on the size of your mug.